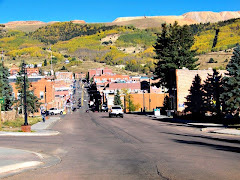 Cripple Creek Colorado Blog: A Cripple Creek Trail Ride! 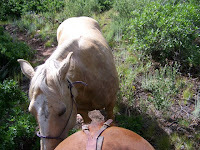 A Cripple Creek Trail Ride! Early Spring around here brings out the intense desire to saddle up the old pony and head for the hills....here are a few photos of one of my favorite rides. Its quiet, remote and challenging. But it is also a great place to ride in the Early days of Spring! Most of the photos are of my horse's ears as we stop along the trail, but occasionally I do have a group of girls that go with me. I am on the sorrel horse on the left, in the pink shirt at the BLM trailhead, and those are my good friends Sherry & Sharon. landmark as I wander through the brush. 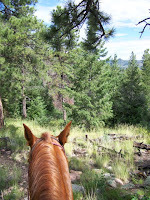 I often take along my spare horse, and here is a photo of Willow as we stop for a break along the trail. I like to keep 2 horses shaped up through the summer. Luke is my main ride, he is the sorrel horse I am riding. 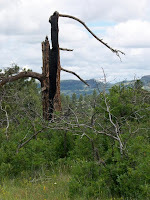 Hope you enjoy these photos!